Hey Joe – Where are you going with that survey? Those were the now famous words of shadow treasurer, Joe Hockey on the ABC’s 7.30 Report in response to claims of media manipulation the night after he gave his budget reply at the National Press Club. So it with interest that I received a letter from Joe, my local federal member, which appeared to be asking me my thoughts on matters of national significance. 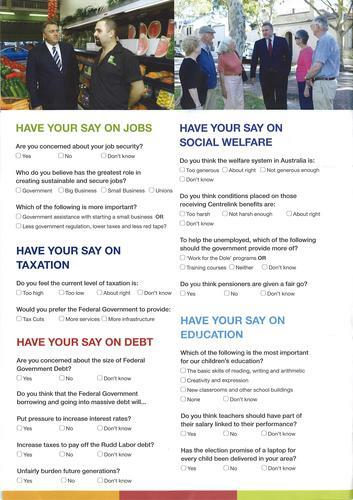 It was to my dismay that after fully reading the letter from Joe, it was apparent it was nothing more than a dodgy "local issues" survey attempting to cynically mislead his own North Sydney constituents on issues ranging from debt, tax, and education to the NBN, the Internet and health. Now, while you would expect most politicians to put some kind of spin on issues when they can get away with it, the survey is nothing but a blatant attempt to skew the results in favour of his apparent policy positioning. In both situations respondents can tick a ‘Yes’, ‘No’, or ‘Don’t know’ check box. But that’s it. No other questions. No other context. While those who have followed the NBN already know how ridiculous these questions are, the problem is there is a swathe of the general population that haven’t heard of the plan or read up on the issues involved. Not asking them to begin with if they are familiar with the issues involved or even if they think the area would need better telecommunications infrastructure in the future is irresponsible – regardless of whether you like the NBN plan or not. No mention that the Opposition also supports this plan and that there is a surging body of evidence that it is an ill-informed idea. Again, no mention that the Opposition is going to cut this plan and even if you answered, ‘No’, that wouldn’t change if the government did in the Federal election this year. The same kind of misleading questions are evident on most of the issues Hockey presents and it is clearly aimed at colouring the views of respondents. So you have to ask yourself, is Hockey merely trying to prop up his and his party’s position on these issues? Is it really going to provide him with the facts needed to make an informed decision? One of Hockey’s responsibilities – and is incumbent on every elected representative across Australia - is to provide constituents with all the information he possibly can and to gather in the most objective way possible as much evidence as he can to serve them through policy making and trying to get it through parliament – not merely pursuing opposition for opposition’s sake. You can’t make informed decisions on uninformed facts. And deliberately trying to skew a “local issues” survey in this manner is repulsive and not befitting a member of our parliament. Indeed, it is potentially damaging not just to the ICT industry with the questions I’ve pulled out above, but across the economy. So much for fact-based policies and trying to be “fair-dinkum”.